The infamous rivals: 3DR and DJI. These two companies are the top manufacturers of today’s hobby and professional-use drones. However, DJI has been around for longer, sold more drones, and currently employs 10 times the staff. If you do your research, you will notice that DJI and 3DR have a lot of history. Colin Guinn, the Vice President of Marketing for 3DR once was with DJI. And he had a big role of starting up sales of DJI products in North America. Long story short, Colin left DJI after complications regarding the direction in which he thought DJI should of went. Frank Wang, the current CEO and founder of DJI says that he will forever be the biggest drone company regardless of Colin Guinn’s help. On to the good stuff…3DR just released a new drone called the Solo, which is stated is to fly and capture cinematic shots all by itself! Orbit, Cable Cam, and selfie shots are all automatically piloted by the drone’s on-board Linux based computers. This is said to be the most revolutionary drone ever created. My thoughts… Even though the Solo sounds amazing, I am very skeptical about it. Are we really ready to trust autopilot systems? I’m not. The Solo has all the same safety features as DJI drones like Return to Home, but this is not what worries me. Do me a favor, go on YouTube and browse 3DR’s solo. You will find that people have already crashed a few due to bugs in the firmware. DJI’s Phantom however, has been around longer and has already been through similar glitches, which are now worked out. Flying safe is the most important thing guys! People are forgetting that drones are AIRCRAFTS and can seriously hurt people. The Solo is not ready, in my honest opinion; there should have been more beta testers involved before the release of this drone. 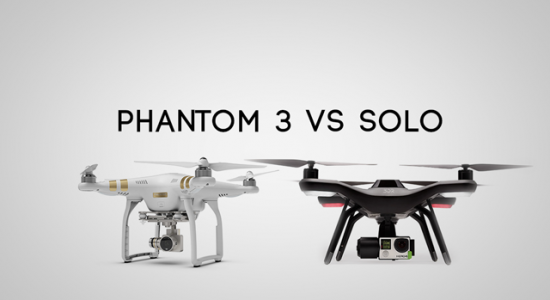 DJI’s Phantom 3 offers you more reliability, which is a deal breaker for me. Plus, they will be releasing a new firmware that will also have the same capabilities as the Solo. DJI’s cameras also use Sony’s high quality Exmor sensors that give you better dynamic range and overall picture quality when compared to Go-Pro cameras. If you have your mind set on the Solo, I would wait a few more months until the crashes have stopped. But don’t forget that DJI’s Phantom 3 is ready to roll and is roughly $800.00 cheaper. Good luck shopping for your next drone! I can’t wait to see what you will shoot next! I put my money down for the Solo and ended up canceling the order. They gave me a delivery date,two weeks, and when the unit never showed up I tried to contact them. That’s when I decided to pull out of the deal. The company was very unprofessional, the answering service said it would get back to me in a timely manner. After a week of no reply, not even a email, I decided to do a little research of the company. Turned out the unit is for sale at Best Buy. Each store had two to four units in store, the only BB store that had one was in Hawaii. When I asked the manager to contact 3DR I was told he was being treated the same way and that they were on back order for months. If you say your going to deliver don’t take a persons money if your not. That same day I contacted DJI, three days later I was flying. I am sorry to hear that, but I am 100% sure that you will LOVE your new Phantom 3!! !